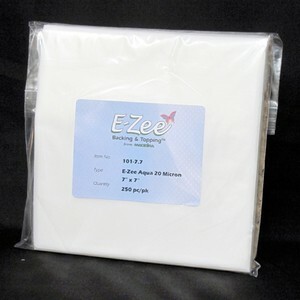 • E-Zee Aqua Supreme is a water soluble topping that prevents intricate parts of the design from sinking into the nap or pile of a fabric and getting lost. • The crispness of a design can be enhanced as well, especially when using a thinner 60 weight thread. E-Zee Aqua Supreme Topping 20 micron is a water soluble topping that prevents intricate parts of the design from sinking into the nap or pile and getting lost. The crispness of a design can be enhanced as well, especially when using a thinner 60 weight thread. Use on top of high profile fabric, such as fleece, sweaters, corduroy and other soft knits. E-Zee Aqua Supreme Topping 20 micron is a water soluble topping that prevents intricate parts of the design from sinking into the nap or pile and getting lost. Great for high profile material!